It's amazing the lengths some will go to to win friends. Gaining the trust of furbolg tribes, mushroom men, frost giants, and other organizations of demi-goblinoid races can be a lot of work, and it can be easy sometimes to lose track of one's progress. That's where Fizzwidget Industries comes in! Our newest gadget not only helps you keep tabs on whose respect you're earning, but also how much more you could earn by turning in certain items you're carrying. When equipping a faction's tabard (i.e. tabards which apply reputation gains in dungeons to that faction). Factions marked as "Inactive" in the reputation pane won't be automatically switched to. Enhances the reputation watch bar with extra shading and a marker to show how much reputation you can readily gain by turning in and/or using items in your bags or bank. Mousing over the reputation watch bar (or the aforementioned marker) will show a summary of the reputation points that can be earned through turning in or consuming items. If your potential reputation gain from turnins is enough to reach a new standing (e.g. Friendly vs. Honored), the "empty" part of the bar will be shaded differently, and the tooltip will show your new standing (and how many points into it you'd be) after all turnins. Adds an icon to the builtin UI's Reputation panel for factions you can readily increase -- mouse over it for details. Didn't know your bank was full of stuff you could gain reputation from? Now you do! Visit FactionFriend's page on GitHub to post bug reports, contribute improvements, or live on the bleeding edge. - Oops. The version released as "8.0" didn't include the v8.0 TOC update and readme content. This one does. - Updated for WoW Patch 8.0 and Battle for Azeroth. - Fixed issue where "paragon" factions (those that allow additional gain past exalted for extra rewards) kept getting marked as inactive. - Chat messages for reputation gains no longer cause error messages (GitHub issue #22). - Fixes and UI improvements for the reputation watch bar and its tooltip on such factions. - New Insignia for Legion factions introduced in WoW patch 7.2, including the Armies of Legionfall. - Commendations for Mists of Pandaria factions introduced to Timewalking vendors in WoW patch 7.1.5, and corresponding Timewarped Badge -> Commendation -> reputation conversions. - Various other Mists of Pandaria faction tokens that we didn't have before. - Pungent Truffle for Sporeggar reputation. Just in time for the Glowcap Festival! - Added Drowned Mana for Conjurer Margoss reputation. - Fixed an issue where the "Show enhanced reputation messages in chat" option would hide reputation gain messages for Conjurer Margoss (and possibly others). - Now tracks items that increase reputation with Legion factions on use (e.g. Wardens Insignia, Arcane Tablet of Falanaar). - Fixed typo in settings. - Now tracks faction Commendations purchaseable with Timewarped Badges (thanks Dragonwolf). Also tracks available badge -> commendation -> reputation conversions. - Now tracks Medallion of the Legion if you're lucky enough to find one (or rich enough to buy a few at the AH). - Now shows a blue "!" in FactionFriend's menu (right click the reputation watch bar) for factions where you have available reputation gains. - Fixed issue where the blue "!" we show in the default Reputation window (indicating a faction with available reputation gains) wouldn't appear when it was supposed to. 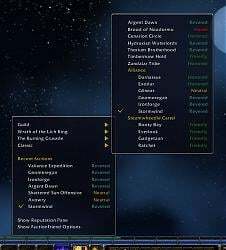 - Fixed issue where choosing a recent faction from FactionFriend's reputation watch bar menu wouldn't work if that faction was marked Inactive. - Updated for WoW Patch 6.0 and Warlords of Draenor. - Added turnin info for the Steamwheedle Preservation Society. - Removed info for reputation boosts purchasable with Justice Points, as Justice Points are no longer in the game. - Fixed an error when mousing over the reputation bar for friendship factions in certain circumstances. - Updated for WoW Patch 5.2. - FactionFriend no longer needs to observe an increase in reputation to detect whether a faction has a Grand Commendation bonus. - The Klaxxi turnin "Seeds of Fear" requires 5 Dread Amber Shards, not 20. - The feature that recolors reputation bars and related UI (such that, e.g. Friendly through Exalted use distinct colors instead of the same green) is now optional and disabled by default. It was causing "taint" and "blocked action" errors for some users, but if it causes you no trouble you're welcome to enable it. - Friendship ranks appear appropriately on the reputation watch bar and in its tooltip. - Chat-window messages correctly reflect the amount of reputation until the next friendship rank. - The indicator for additional reputation available from turnins is correctly placed. - We now detect when you gain reputation with the bonus from a Grand Commendation; thereafter, estimates of reputation gain for that faction reflect the bonus. - Fixed an error that could occur when showing a faction report tooltip including info on purchasable tokens (e.g. [Sons of Hodir Commendation Badge]) when info for said tokens is not yet available to the WoW client. The names of such items are now in FactionFriend's database (for English, German, French, Spanish, Portuguese and Russian locales), and if we still don't have the name for an item we'll show its numeric ID instead of throwing an error. - Fixed an issue where we'd fail to detect the "Mr. Popularity" guild perk (which increases reputation gain) as intended. - Some internal architecture improvements. - Updated TOC to indicate compatibility with WoW Patch 5.1. - Added Huojin and Tushui for automatically switching the rep bar when the appropriate tabard is equipped. - Fixed an issue where "gibberish" (color codes) could appear before text. 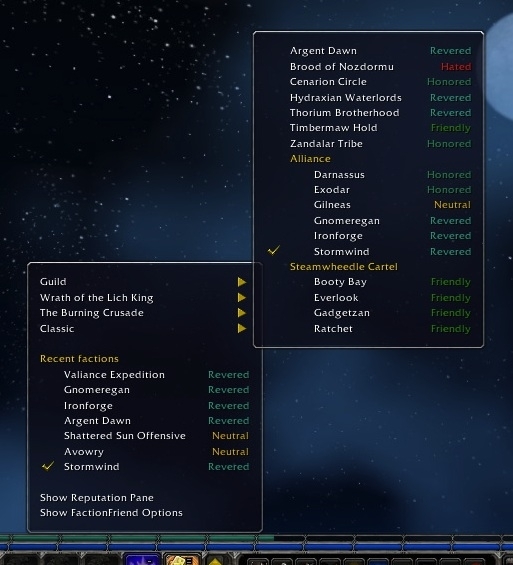 - The reputation watch bar menu uses friendship-level names for friendship factions. - Updated for WoW Patch 5.0 and Mists of Pandaria. - Fixes errors which could appear when playing a Pandaren character who has not yet chosen a faction. - Fixes error when attempting to apply a glyph. - Fixed an error that could occur when gaining/losing guild reputation while not in a guild. - When calculating potential reputation gain, we now ignore rep gain from items purchased with currency unless no other turnins are available. - For example, if you are farming Relics of Ulduar for Sons of Hodir reputation, the reputation bar will show only the gains you can make by turning in those items, instead of obscuring that information by showing that you can gain lots of reputation by spending Justice Points on Commendation Badges. Once you run out of Relics, the bar will show how much further you can get using Justice Points. - Better customization and reporting for this feature will come in a future update. 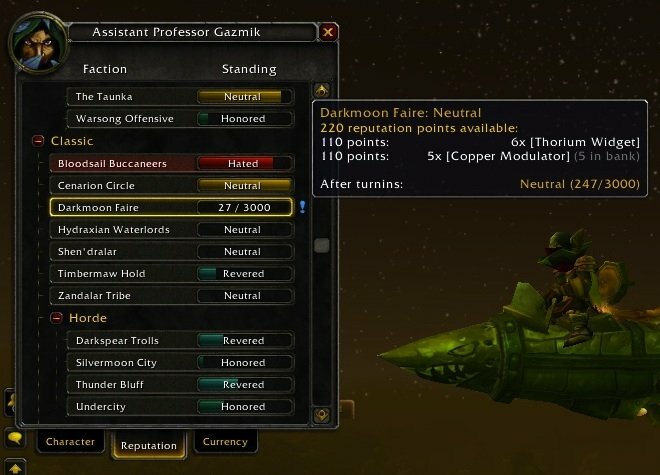 - Removed turnins from the old (before Patch 4.3) Darkmoon Faire as they are no longer available. You can get rid of your Evil Bat Eyes now. - Fixed database entry for Oshu'gun Crystal Fragments so that those items are properly counted for potential reputation gains. 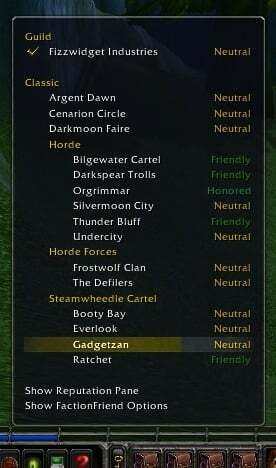 - Fixed an issue where certain kinds of turnins (including some from the old Darkmoon Faire) could be incorrectly counted as providing negative reputation. - Updated TOC to indicate compatibility with WoW Patch 4.3. - Fixed incorrect numbers shown on the reputation watch bar (bug introduced in 4.2.1). - Fixed an error when using zone-based switching of the reputation watch bar. - Fixed strange behaviors related to the quest log. - The text on the reputation watch bar (when moused over, or shown by the default UI in various other circumstances) now displays your current standing (Hated, Neutral, Friendly, etc) with the watched faction. v. 4.2 - 2011/06/28 - Big Update! - Updated TOC to indicate compatibility with WoW Patch 4.2. - Now adds an icon to the builtin UI's Reputation panel for each faction you can readily increase -- mouse over it for details. Didn't know your bank was full of stuff you could gain reputation from? Now you do! - Improved item info caching, so tooltips indicating which items can be used to gain reputation should always have the actual item name. - If your current reputation is below Exalted, we indicate only the number of gains (turnins / item uses / etc) required to raise the reputation into Exalted. - If your current reputation is Exalted, we indicate the number of gains required to max out at 999/1000. - The tooltip detailing reputation gains (now visible both from the reputation panel and reputation watch bar) now always shows the amount of reputation you'll have after all applicable gains (instead of only showing such if you have enough to reach a new standing). - Fixes an error which could appear when we try to draw the reputation watch bar menu. - Potential reputation gains are displayed for Baradin's Wardens / Hellscream's Reach Commendations purchasable with Tol Barad currency. 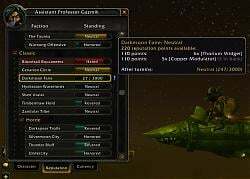 - Icecrown Citadel / Ashen Verdict is now included for zone-based switching of the reputation watch bar. - Potential reputation gains are displayed for racial faction Commendation Badges and [Champion's Writ] from the Argent Tournament. - Potential gains are also displayed for Northrend faction Commendation Badges purchasable via Justice Points. - Zandalar Tribe: no longer associated with Zul'Gurub for zone-based switching of the reputation watch bar. - Argent Dawn: no longer associated with Plaguelands, Stratholme, or Scholomance for zone-based switching of the reputation watch bar. - The API we provide (so that other reputation bar addons can make use of FactionFriend's features) has been expanded and better documented. See readme-API.txt for details. See http://fizzwidget.com/notes/factionfriend/ for older release notes. I can't get it to open the menu where you choose what rep to show on the bar when I right-click it. Would appreciate it if anyone has got a solution, thanks! WOOT Thx for the update!! Author on Github said he would have it out for BfA! I've got a few 8.0 updates out now, but this one is taking a bit longer — they really messed with the XP/reputation/etc bar architecture in 8.0. Still looking to be ready before the Battle starts, though. Cool Thx.. This is one of my favorite addons and have not been able to find a decent replacement.. They seem to have really messed with it. Mine keeps appearing and disappearing and getting errors from anything that touches those 2 bars. Last edited by Enigma_TL : 08-02-18 at 05:50 PM. Anyone have a fix for 8.x? Love this addon, someone fixed it for 7.x am hoping they do the same for 8.x. Hoping for the same thing here, this is a great addon. Yea I have tried a few other ones but NONE are as light weight or give the same info such as how many more reps you need to next lvl or anything but a simple min/max. Any chance of a 7.3 update? Or is there another addon out there that does the same thing? Thx for the update. I tried the quick fix but must have done something wrong. Still got the error but FF Still seemed to work. Seemed to do the trick, thanks for the quick fix. It's not a complete fix, but it gets rid of the error. Love this addon been using it since it was created. Any chance on getting an update for 7.2? It works fine for non Paragon reps but the min you get any into the above exalted paragon rep it throws an error. Just noticed this too a few days ago but I can't remember the exact error message. Love this addon, simple and straightforward. Edit: Found the error and will post it to the addon website. Although it seems to be much more involved than just commenting out a few lines here and there in the lua. Last edited by Kyrgune : 04-01-17 at 05:40 PM. I use Bartender. In the Pre Legion areas, I still get the Reputation Bar. Whenever, I am in any Legion zone, the Reputation bar disappears. Any ideas why? This happens to me as well. I like the chat messages enough to lose the bar (for now) but it'd be nice to get it back. Like the gizmos? Tip the engineer!